The highest recommended Catholic catechism gives straightforward answers. Catholic catechism class gets easier when you have an audio Baltimore Catechism and Catholic worksheets for First Holy Communion and Confirmation. Memorizing the basic Catholic answers is most of the hard part of learning the answers. Finding time for the review necessary for memorization can be tricky. Teaching the catechism is easier when you can review using audio CDs, Catholic worksheets, and Catholic coloring pages to print. The Baltimore Catechism has been the foundation for catechism class for over one hundred years. When families and schools started to recover from the revolution of the sixties, which catechism did they trust? FTC Disclosure: I recommend products I think will help you. If you buy through my links I may earn ad commissions. No extra cost to you. Why the Baltimore Catholic Catechism? Why? Because it had the Catholic answers that we recognized from our parents' and grandparents' time. 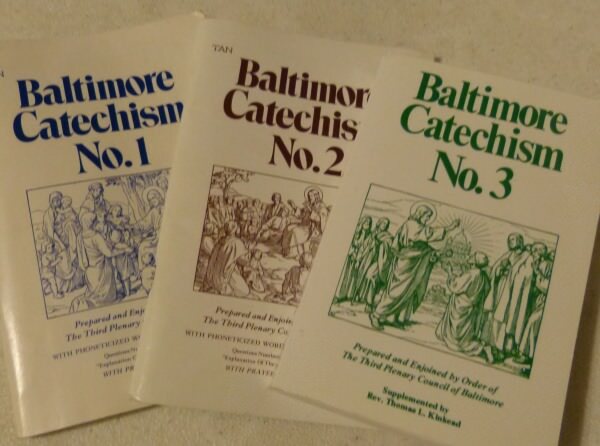 Since there are very many versions of the Baltimore Catechism, there are some differences amongst them. The easiest to trust is the oldest version from the 1880s. It is divided into several sets, but basically the No. 2 and the No. 3, mainly because the No. 2 has all of the No. 0 and No. 1 questions and answers. Later editions under the Confraternity of Christian Doctrine had some good improvements, especially for First Communion. For instance the plural confession answers were improved to the singular. Of course, later editions also made unworthy changes which are not noted in the books. By law minor revisions and omissions are not required to be marked in new editions and this is how so many revised books do not mark their revisions. Over 25 or more years I have compared a whole 18 inch stack of "Catholic catechisms" and have sorted out the contradictory or omissive questions and answers. I only recommend the best that we have found as parents of school children, as parish catechists, as long time Catholic homeschoolers, and as parents of religious. Almost all of the Catholic home school programs offer some form of the Baltimore Catechism and all of our Saint Anne's Helper Questions and Answers are from imprimatured versions. In the course of these many years we've had some students who could memorize the answers, the Ten Commandments, and the Catholic prayers with almost no effort. For one thing, the prayers of the Rosary are easy for children whose families say the daily rosary. Do be sure to teach how to pray the Rosary. Praying is vital to receiving the sacraments well and if your children have them memorized before catechism class, they can easily focus on the rest of the answers. Otherwise, the main points necessary to learn in a catechism are simple. One point is to be sure not to make catechism class an onerous effort. Keep it simple and happy. Fr. Leo Pyzalski said in his School Sisters' Vade Mecum that it may seem that the class that is busy with activities is better, but in the end the plain humble conveyance of truth wins the children's hearts. If you must fill required class time though, you'll be grateful for some of our Catholic Coloring Pages and Catholic Worksheets on this site. We've recorded the questions and their answers as well as the Roman Catholic prayers on a track by track audio recording and added the verbatim text to the same CD or Download. Since we had the text available, all we had to do was change the font and rearrange things to make Catholic worksheets for the same information using the copy book method. We've heard from teachers, catechists, parents and students who appreciate Saint Anne's Helper's excellent Catholic catechism help for both First Holy Communion and Confirmation students. Memorizing becomes easy with multi-sensory teaching using an audio book download or printable worksheets. These last also make great handwriting practice and homeschool worksheets. The more ways a student learns a truth, the better he can remember and use it for life. Catholic Printable Worksheets are handy to use in class or to send home for catechism reinforcement. Catechists can send their students home with audio help. Check the sound of these Catholic audio book downloads. Saint Anne's Helper Catechism Copybooks teach the Baltimore Catechism version of the answers about the seven sacraments. The concise Catholic answers to the Baltimore Catechism questions that concur with the basic Catholic beliefs taught in any Catechism Course (CCD) are easier to learn because they are concise and precise. The Baltimore Catechism for children teaches the basics for the adult Baltimore Catechism versions so that converts will appreciate the ease of learning with an audio CD (or Download) while driving or doing light chores. The copybook method of explicit instruction aids penmanship practice as well as memorization! Order them here. How do we know God's will for us? Simply obey and practice every step of the Catholic Catechism. After that? Do what our superior or honorable third parties suggest. What about learning the truth when there are so many versions of the catechism? A real bug-a-boo arises when one sacrament's questions do not have the same answers to the very same questions! Adding and expanding the meaning is to be expected from the higher level catechisms, but changing the meaning is unfair, confusing, and sometimes gives reason for doubting the Catholic beliefs. One thing that astonished us is that copyright law does not require new copyright information for minor revisions or omissions. The Imprimatur and Nihil obstat can't be depended upon either (Bl. Pope Pius IX Pascendi #60). Neither guarantees that what one thinks is an old Catholic catechism has been republished without change. It is not required that revisions are noted. Important truths can be altered at will without informing the reader or customer! The Imprimatur and Nihil Obstat are not the safety that we would like them to be. At best they only state that there is nothing against the faith in the book. At worst, they make this same statement when it is not true. At least in the past the books that have revisions that can be trusted are the books that mark the major revisions so that one can find them and compare. Our recommendations for books and other media are based on twenty years of teaching the Catholic Catechism for the sacraments of Baptism, First Holy Communion and Confirmation. Along the way the other sacraments are studied, but not as "preparation" for their reception. We're recommending the best that we can find so that you don't have to search as much as we did. Catholic religious education has its joys. Finding good resources to teach the Catholic catechism comes first! Our favorite resources after solidly Catholic books are CDs and copybooks! They have helped our wiggly worms as well as our easy learners who could memorize an answer just by hearing it in the background (ambient learning). Also, the audio CDs can be carried anywhere. Catechism Copybooks have been an easy way to hand a constructive assignment to a child who needed something to do while teacher was too busy to explain the directions in a workbook. They can be bound or left as copywork sheets. As an added bonus, the copybooks were an easy way to help penmanship practice. Dictation Using A White Board! An 8' x 4' white board is usually less than $20 if you get melamine coated masonite! Frame yours, if you like with, inexpensive mold-board. This way the teacher can teach from dictation with some copy help for younger students. With the dictation approach the teacher does not write the word first unless the student has trouble with a new word. The teacher reminds the student of a particular phonics rule or then models how a big word is spelled. This takes longer, but rewards the student with life-long spelling skills and they learn so much more if you're also teaching the facts of the catechism and the stories of the Catholic Bible at the same time. We like to combine subjects. The Catholic home school programs have great ideas here. Read Laura Berquist's ideas about using real books in her Designing Your Own Classical Curriculum. The real nitty-gritty to catechism class is memorizing the answers to the questions. Once we found the best Catholic answers we still had to convey them to the student. What catechism help was available for a child who can't sit still? Or the child who can't yet write well? Or adults who need a quick way to learn the Ten Commandments and the Apostles' Creed? We offer our audio CDs and downloads. Learning the Catholic catechism as an adult for Baptism, First Holy Communion, and Confirmation is easier with our First Communion and Confirmation Catholic audio books. What about reviewing the questions for a cumulative review at the end of the year by the pastor? What would be best for an RCIA program or Catholic CCD class? Most importantly, where would we find low pressure aids to learning truth well? Check our order page for wonderful help. If you use the Baltimore Catechism, you'll love SaintAnnesHelper.com! Order Baltimore Catechism worksheets. Choose fonts, colors, and SIZES. Thank you for visiting! Do you need free Holy Day reminders? "We read St. Patrick Apostle of Ireland as a family and loved it. It reads like an adventure of his travels and miracles. Wonderful book!"